Goody my sweet friends. Last time I got such great response when I showed off one of the golden oldies from my blog. That I thought let’s do that again. I gave an old post a little wash and shine and she is here in full glory for you today. This project lasted a really long time. I got lots of good use out of it. Until I dropped it…. It didn’t survive that. But here on my blog it lives forever more. Take a bite out of my plaster cupcake candle holders. Today I want to make good on a promise. 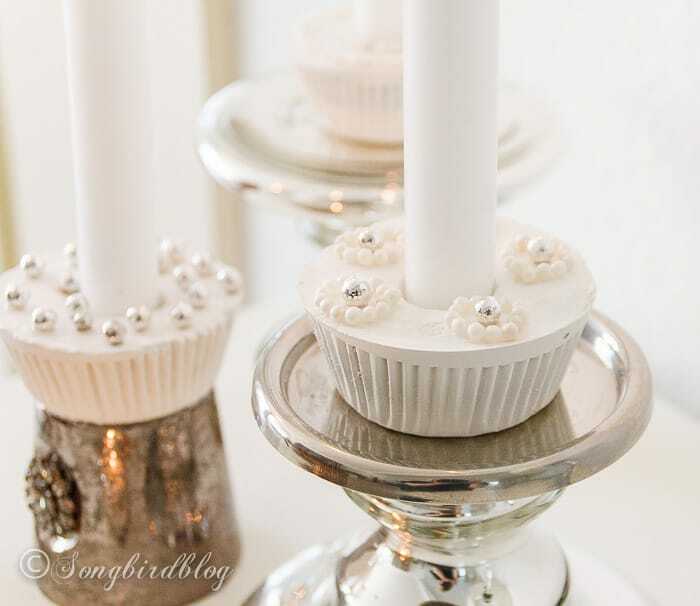 I promised you I would show you how to make plaster cupcake candle holders yourself. The first time I made them I was making it up as I went along, and not all of it went as planned then. So I decided to ‘bake’ another batch of cupcakes to make sure I’d be giving you all the right instructions (but the pictures of the cupcakes in the making are of the first batch). I had some major fun this time and even decorated them like real cupcakes. I think they look pretty yummy, don’t you…. Ok here is how you cook these babies up. Mix water with plaster. Estimate the quantity you need, depending on how many cupcakes you want to make. Gently mix it together, you don’t want to create air bubbles. Mix until your ‘batter’ is slightly runny so it will even out when you shake it a bit, but it is not too liquid anymore (think thick Greek yogurt) or it won’t firm up properly. Just keep adding water, or plaster until you get it right. Fill your cupcake papers. A silicone cupcake ‘tin’ will make removing the cupcakes really easy later (just remember to put it on a tray first, because it is hard to move otherwise). But a regular tin works too. Remember to fill up those papers, because this batter won’t rise. if you fill above the paper you will get a solid band on top (like I have with this batch). Shuffle the tin a bit until the top of the cupcake evens out. Any imperfections you can remove now, will save you sanding time later. Immediately push a candle holder thingie into the batter. Aim for the middle and don’t distort it’s shape. Put something small and heavy in it to keep it down (I used bolts, but heavy marbles would work too). Remove paper, sand or any imperfections, spray paint with primer, and then spray with the paint color of your choice. I embellished with real cupcake sprinkles. I used Glossy Accents glue to attach the pearls. One more tip. Leave the tub and spoon to dry! Don’t rinse them out in the sink, because the plaster might clog up your drains. If you leave it to dry fully, you can later just dent the tub (that’s why I recommend something plastic and bendable) and the dried plaster will come loose and you can just put it in the trash and use the tub for your next project. I have never ever baked a real cupcake, let alone decorated one. So this is in fact my first attempt at decorating baked goods. I am sure you baking queens out there could come up with much better designs. But I am secretly quite pleased with my decorated cupcakes. I think they look really festive, and I could see myself decorating a whole party table with these babies. They’d make great wedding decorations too. You can even put them out in the sun, and you wouldn’t have to worry about the icing melting. Of course you can use any mold you have to make candle holders like this. Just as long as it will allow you to get the hardened plaster out. I tried it with cookie cutters too, but that didn’t work so well, because I couldn’t get the candle holder out without it crumbling and besides I don’t think they would have been heavy enough to hold a real candle. But I am sure you could all go to town with this idea. If you have any more questions just put them in the comments and I’ll answer them there for everyone. So anyone else gonna ‘bake’ some cupcakes? Hi Marianne, This reminded me of the pretty candle holders and roses you made from doilies and plaster. You should add that link to your post for your newer readers. These are really pretty, but I think they’d make we want to eat a cupcake! I’m glad you’re posting more regularly again. Thanks for the do-able ideas! Oh I used to make stuff from plaster of Paris all the time. I wonder if I still know the feel of just right?!!! I absolutely love these. I like how you did them. I want to mimic yours as the simplicity makes them elegant mixed with candles and Mercury glass. Oh no. You don’t get off this easy!! I want to know that you tried them again!!! I’m trying to work them into May Day but no. You’ve got flowers galore over there of the real variety. But oh wouldn’t it be a sweet gift wrapped in cellophane and tied with some of your stash of ribbon? I leave it up to you to tell them obtw don’t eat it!! !